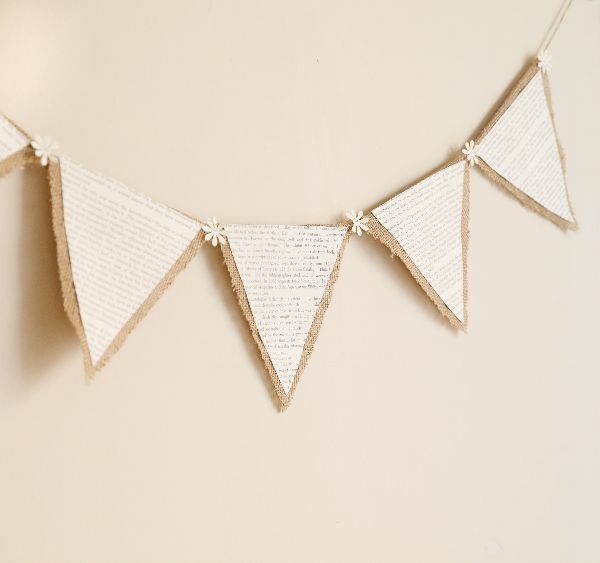 Bibliophiles love books, and although they may not have the hearts to throw away literature of any kind, they might be persuaded to reuse those books for a craft that decorates their homes. This project is great to hang in a personal library of home office, or use the banner in lieu of plastic celebration banners found in stores. You may make these as long or as short as you want, such as long enough to hang across an entire wall or short enough to hang over a doorway. 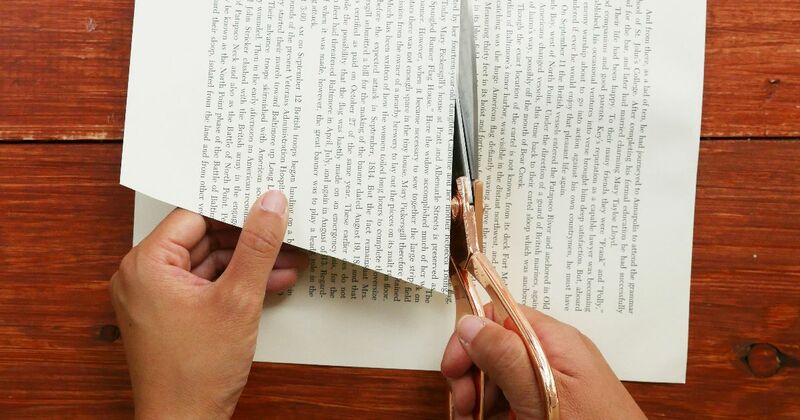 If you really can't bring yourself to tear a book, use magazine pages or decorative scrapbook paper instead. 2. One-half inch down from the top, use a ruler and pencil to draw a straight line across. The line should be as wide as you want the top of the rectangle to be. 3. Using the ruler and pencil, complete the triangle, drawing the sides as long as you want the shape to be, and meeting at a point at the bottom. 4. Cut out the triangle. 5. Repeat Steps 1 through 4 for as many triangles as you want. 6. Lay out the shapes next to one another, top corner to top corner, to make sure you have enough. 7. Set aside the triangles. 8. Place the burlap on the work surface and smooth it out as best you can. 9. Position the triangle so you have at least 1 inch of burlap sticking out from the top and 1/2 inch of burlap around the remaining two sides. Do not position it flush with the top or sides of the burlap. Start near a top corner so you don’t waste the fabric. 10. Apply glue to all edges of the triangle. 11. Adhere the triangle to the burlap. 12. Cut around the triangle, leaving 1 inch of burlap at the top, and ½ inch on the sides. 13. Repeat Steps 9 through 12 for each triangle. Let them dry. 15. Turn over one triangle and place it under the twine, 6 inches in from one end. 16. Apply a line of glue along the width of the burlap, 1/2 inch down from the top. Adhere the twine. 17. Repeat Steps 15 and 16, placing the triangles point to point until all have been glued to the twine. The last triangle in line also should be approximately 6 inches in from the twine’s end. 18. With the burlap still facing you, apply glue to the first triangle along the edge of where the upper side of the twine meets the burlap. 19. Fold the burlap over the twine and press along the twine. 20. Repeat Steps 18 and 19 for all triangles. Let them dry. 21. Flip over the banner. 22. Punch out several decorations in the cardstock. 23. Glue the decorations between the triangles where the triangles’ points meet.